12 pink and red roses paired together with decorative greenery. 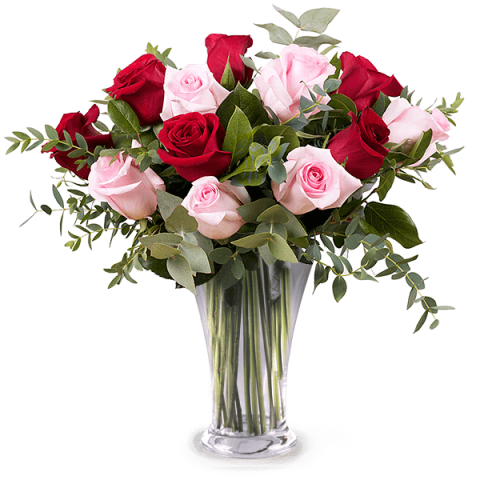 Make a rose bouquet delivery in time to make someone smile on a special day with FloraQueen. Flowers delivered to over 100 countries with 7 days freshness guaranteed. The New Year’s celebrations are always a time of festivity and one of the best ways to send an emotional symbol of joy and optimism for the 12 months ahead is with a bouquet of flowers. With beautiful roses, lilies, gerberas and the many other popular flowers you can find in our bouquet arrangements you can add some natural colour to this vibrant celebration in over 100 countries. Let us tell you how. New Years Eve is all about bright colour and fresh optimism and appropriately the flowers you give at this time of year should reflect this. With the New Year’s festivities not only being a bridge between years but also the bridge between months, a lot symbolic flowers for December and January are perfect for your surprise. It only takes a few clicks and once you’re done, we’ll take care of the rest. We can deliver on the 31st in most countries but restrictions may apply in some locations. Our last guaranteed orders before NYE must be made by 3PM (CET) on December 31st.